If Penny Brighton didn't have bad luck, she'd have no luck at all. She lost her job. And her apartment. In the same day. But it's okay, her friend has a cozy storage unit she can crash in. And there's bound to be career opportunities at the neighborhood laundromat-just look how fast that 12-year-old who runs the place made it to management! Plus, there's this sweet guy at the community center, and maybe Penny can even have a conversation with him without being a total dork. 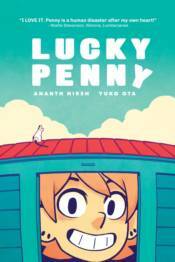 Surely Penny is a capable of becoming an actual responsible adult, and if she can do that her luck's bound to change! Right?